So far we've installed a fan vent, planned the remodel, and did some demo. That left us with a nice blank slate to start off with. There were pits and uneven spots everywhere! We could have replaced all the drywall with new, but we've done that before and we'll be the first to admit that our mudding skills are sorely lacking. So I broke out the spackle jar and got my spacklin' on. Call me crazy, but it was sort of therapeutic filling all those cracks and gaps. And when I was done, all it needed was a light sanding and we were in business. 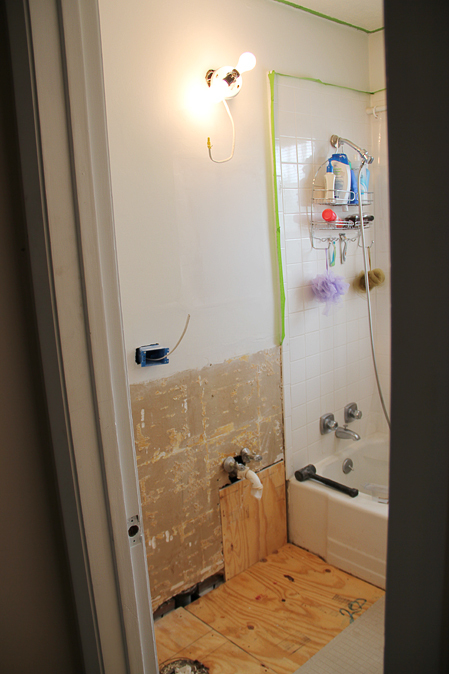 Of course it still won't be as nice and even as brand new drywall would be, but it worked pretty well for us. Next we had to figure out the medicine cabinet dilemma. We already had a mirror that we wanted to use from Tom's Mom (thanks! ), and it would work perfectly. It was a regular mirror, and we had a medicine cabinet already installed in the bathroom. 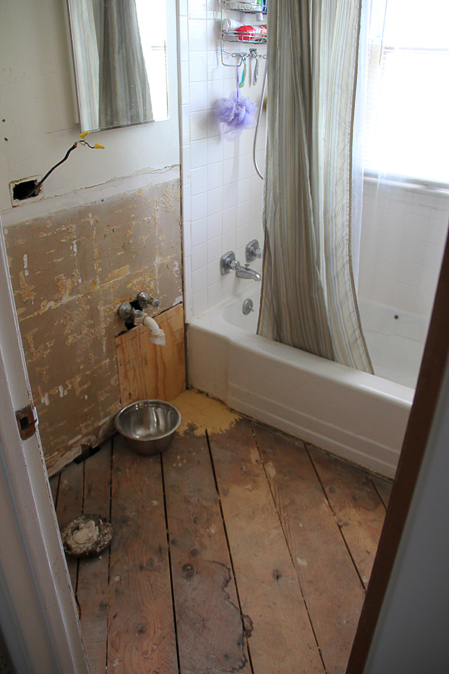 Once we took the medicine cabinet out, there was a huge hole in the wall. So we put in some drywall and added a bit more spackle, and it looks pretty decent. It's not perfect but it's going to be mostly covered by the new mirror (and any future mirrors), anyway. 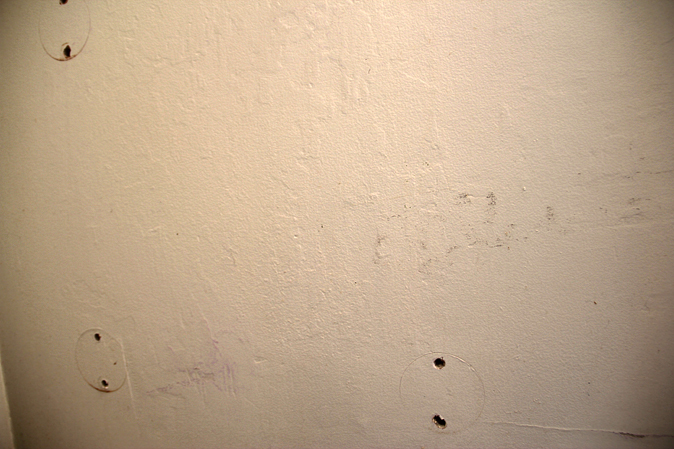 The goal was to get rid of a giant hole in the wall, not make it perfect. That done, we could move onto more exciting things - like primer and paint! Woohoo! You guys have gotten so much done! 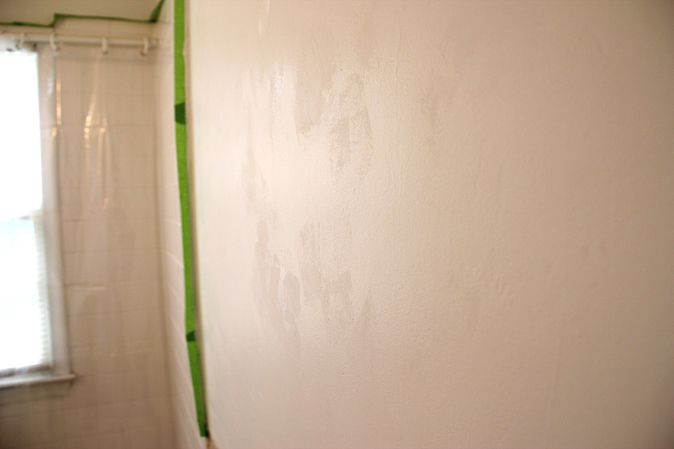 The spackle really helped- I might try that in our bathroom to smooth things over. Can't wait to see the new paint color!! I too am excited for the paint color you guys choose! You have such sophisticated, yet simple and quaint style. I love it!